The removal and reconstruction of a large part of the chest wall is often required to treat malignant tumors that occur in the cartilage or bone of the ribcage. However, the potential for complications in these types of surgeries is unacceptably high—the overall complication rate is over 40% and the 30-day mortality rate is up to 17%. Many of the complications are respiratory-related. A team of doctors at Asturias University Central Hospital, in Asturias, Spain suspected that the patients’ difficulty breathing resulted from the stiffness of the implants. 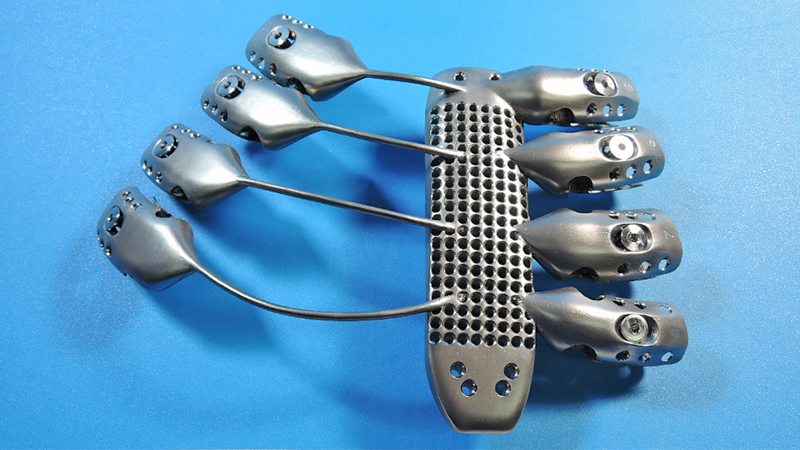 They performed a surgery using 3D printed titanium rib implant designed to be more flexible. Using 3D printing to produce rib implants to replace parts of the ribcage is not new. A world-first surgery with a 3D printed implant was also performed about a year ago, also in Spain, according to articles published in Forbes and Gizmodo (entry image credit). Because each person’s ribcage structure is unique, using 3D printing to produce such implants has the obvious advantage of producing an exact replica. Both implants were made using information from a CT scan, and printed using the same technique—layer-by-layer electron beam melting starting with titanium powder in a high vacuum by an Arcam Q10 printer. In this more recent surgery, the doctors made the implant less rigid by incorporating articulations as shown in the figure, on the right side of the implant. As you can see such a complicated object could only be created in one piece using 3D printing techniques. They published their findings in the Journal of Thoracic Disease. The 57 year old male patient regained normal function after six weeks without complications.